The Sounders know their first priority must be scoring at least once and beating a depleted Portland Timbers side playing its third playoff match in eight days. 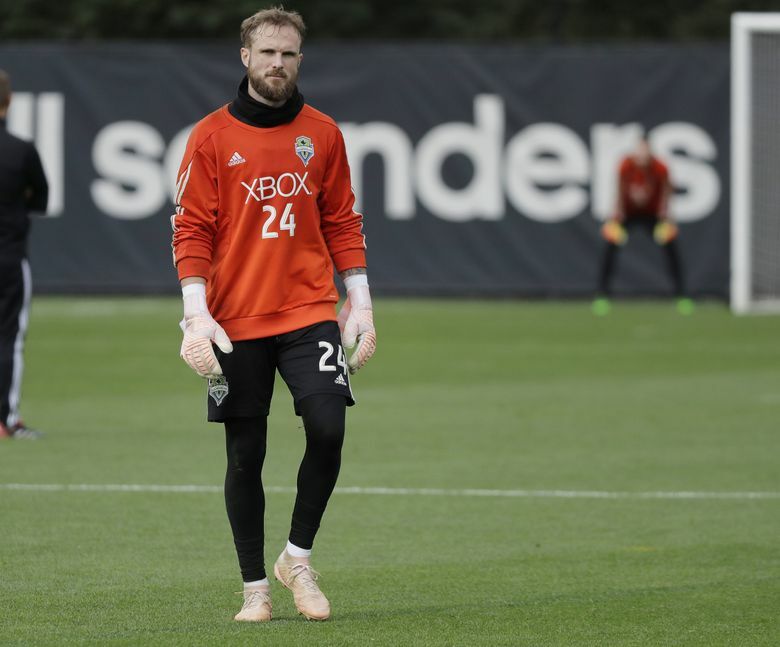 Sounders goalkeeper Stefan Frei wasn’t about to end what could be his team’s final practice of the year Wednesday dwelling on near misses. Frei instead deflected questions about finishing runner-up to Zack Steffen of the Columbus Crew in MLS Goalkeeper of the Year voting and focused on how his team can survive this playoff round. The Sounders need at least a goal Thursday night against the Portland Timbers and for Frei to keep balls out of his net to advance from a Western Conference semifinal they trail 2-1 after Sunday’s opening leg. Rather than a three-hour-plus bus ride home after Sunday’s loss at Providence Park, the Sounders caught a quick charter flight and were back in Seattle by early evening. Any added rest gained from it could prove huge given the earlier-than-expected Thursday scheduling of the second leg due to an auto show this weekend at CenturyLink Field. That schedule puts the Timbers at an inherent disadvantage since they’re being forced to play their third playoff match in only eight days and their fourth game overall in 11 days. Timbers coach Giovanni Savarese at least rested his starters — fairly controversially — for the Oct. 28 regular-season finale, sparing his squad further damage. But if ever a team was poised to hit the proverbial wall of exhaustion, it’s a Timbers side that — except for a brief flurry in Sunday’s first half — was outplayed by the Rave Green for the most part. The Sounders were already upset with themselves postgame for not coming away with at least a draw. Adding to that chip already carried is the knowledge Frei got bested in a highly debatable Goalkeeper of the Year result given that winner Steffen didn’t come close to topping the leaderboard in any critical netminding statistics. Throw in Chad Marshall losing Defender of the Year honors Wednesday to onetime Sounders2 prospect Aaron Long of New York Red Bulls — albeit in a more palatable result — and the home side should have plenty of extra “edge’’ to them going into Thursday’s rematch. Sounders coach Brian Schmetzer didn’t miss the opportunity to message his players about Frei’s snub being a shot at them personally. Frei overwhelmingly won the media portion of the vote, with 31.52 percent compared to 22.73 percent for Luis Robles of the Red Bulls, 16.67 percent for Tim Melia of Sporting Kansas City and only 14.55 percent for a fourth place Steffen. Steffen narrowly won the club staff and executives part of the vote at 24.04 percent compared to 22.12 percent for Robles, 21.15 percent for Melia and 18.27 percent for Frei. But what swung the award for Steffen — almost single-handedly — was an overwhelming 36.18 percent player vote, with Frei placing fifth at just 6.76 percent. Schmetzer complimented Steffen as “a great, young up-and-coming goalkeeper’’ within MLS, but also could barely contain his exasperation with the result. Schmetzer figures Frei will use the result to motivate himself even more against the Timbers. Marshall will have to wait a while to take out any frustrations on opponents, having undergone surgery Tuesday to repair a torn meniscus in his right knee. He’s likely out until at least the second leg of the conference final — if the Sounders make it — and more realistically the MLS Cup final a month from now. And while Schmetzer termed Cristian Roldan a “game-time decision’’ due to a strained hip flexor, he admitted it might be “a stretch’’ for him to play. That leaves Harry Shipp to start in the team’s biggest game of the year. Left back Brad Smith will dress for the game and could theoretically be pushed up to left wing. But he’s missed more than a month with a hamstring injury and looks more like a second-half substitution. Full match fitness will be key in this contest and not only because the Timbers could be running on fumes. The Sounders need to press forward to score at least once while also getting back to defend quickly and avoid Portland’s dangerous counterattack. Geoff Baker: 206-464-8286 or gbaker@seattletimes.com; on Twitter: @GeoffBakerTimes. Geoff Baker covers the Sounders and is a sports enterprise and investigative reporter for The Seattle Times who writes a column on hockey and the NHL.